Maybe you have this problem too: your Compaq iPAQ 3630 (maybe this si an issue for other iPAQs too) suddenly does not work anymore. It didn't drop, you didn't sit on it, it didn't get wet,... never the less, it remains dead. One of the reason it might be in this state is because of the battery. Somehow the battery can die on you - instantly! 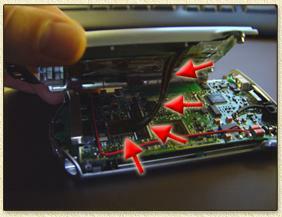 I'll explain a bit how I discovered this problem with my iPAQ and how you can resolve this issue yourself. This is actually a pretty good question! My iPAQ didn't work in the craddle either. Using only the powersupply didn't do any good either. So why doesn't the iPAQ just start? It has power doesn't it? So this can't be the battery ... right? Well, could be true, but did you try to hard reset the iPAQ? This is done pretty easy. 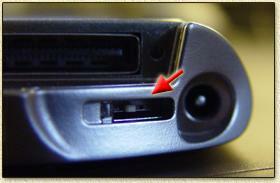 Use the stylus and gently push the resetbutton (indicated with the red arrow in the image above). You might need to push the power on button - but usually the iPAQ now starts ... in that case: your iPAQ is not dead, but it's battery is ... (might need to try it more than once). Remove the powersupply from the iPAQ and you'll see that it switches off within a few seconds - typical signs of a dead battery. Recharging might work, but usually doesn't ... I suggest you try it first before spending time and money in something that isn't broken. I tried to recharge my iPAQ for 24 hours ... and the result remained the same. Removing the powersupply = dead within a few seconds. If the text above doesn't apply to your situation the your problem might still be the battery, but I can guarantee that. The solution is pretty simple: replace the battery. So where can I get a new battery? If you plan to go for the enchanced battery, then please consider visiting either of these companies as mounting this battery is maybe not as easy as replacing it with an original part. So I did the eBay thingy, saved me a bundle since I could by my new battery for $45 - an original 950 mAh. So you decided to read on. OK, we now ordered our battery and received it most likely by mail. It's now time to actually OPEN the iPAQ (scary isn't it?). You might want to make a backup (if there is any data left in the iPAQ). Put the iPAQ - face down, ie screen facing the table you're working on - on a table. Keep it face down for the rest of this procedure! 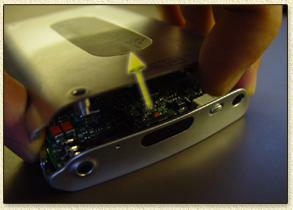 Use the "Power-Off" switch at the bottom of the iPAQ, as shown below (iPAQ facing the table). Move this switch to the LEFT, or see the owners manual to see how this works. STEP 2: Remove the screws. 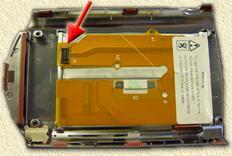 Now remove the screws indicated with the red arrows in the image below. I requires a special screwdriver (torex? ), but I got lucky with one of those el-cheapo screwdriver sets (those miniature sets as seen for a dollar or two). don't be hasty - take your time! 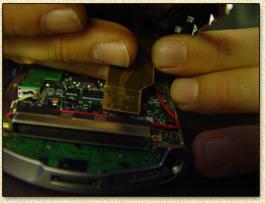 It takes only four (4) screws to open the iPAQ. Taking the frontside and backside a part is not that easy. This is not easy. Keep in mind to remain calm and gentle with the iPAQ - it's all plastic and might break! Also: DO NOT USE SHARP or METAL OBJECTS/TOOLS! The WILL damage the plastic casing of the iPAQ! AS THE BATTERY IS STILL ATTACHED TO THE MAINBOARD! In my experience the iPAQ is best opened by gently pushing your finger nail between front- and backside, as show in the picture below. Do this for bot sides. The iPAQ will not fully open when doing so. 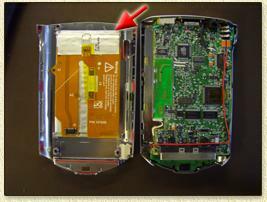 In the backside, you will see the brownish thingy - the battery (indicated with the red arrow in the image above). Gently "peel" the battery from the backside. It's stuck there beacuse Compaq did put some double sided tape between the backside and the battery. Do not use sharp tools! 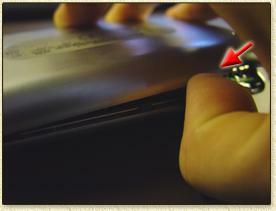 Bending the old battery is not advisable, but I don't think it will harm as it is dead anyway. Just try to avoid that the battery package opens. As you can see, Compaq conveniantly used only two of the 4 pieces of tape. The onces indicated with the red arrows still have their protective cover on it. Peel these of, so we can use then. If you're not THAT lucky, then just hope that the old onces still stick or replace it with new onces. 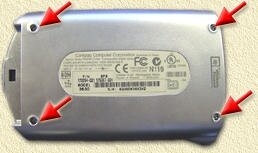 The red arrow indicates the connector for the battery of the iPAQ to it's mainboard. This should be pointing to the bottom on the iPAQ as shown above. Gently put the connector on the connector on the mainboard. Do NOT use FORCE! With some patience it will slide into place. OK, before you close the iPAQ, maybe you want to check if the button for sound reocrding and the button for ejecting the styles are properly in place. Gently click the backside onto the frontside. Don't forget to check the two little pins at the bottom of the iPAQ as these seem to be unwilling to close without a bit of help. Insert the 4 screws and tighten them - do not use to much force here! OK, this is the final step. Undo the "Power Off" switch, by moving it to the right again (see Step 1!). p.s. as you might already know, the battery indicator in the iPAQ takes a few seconds to determine how full it is, so don't be alarmend when it shows "unknown"!